Following the success of the Cultimer L featuring three rows of tines, for tractors from 120 to 420hp, Kuhn has launched a new model – the Cultimer M 300 – for tractors from 75 to 135hp. The new M version has two rows of tines, and is available with a fixed three-metre working width. The Cultimer M retains all the advantages of the Cultimer L but with improved compactness and a lighter frame, making it better suited to small tractors. 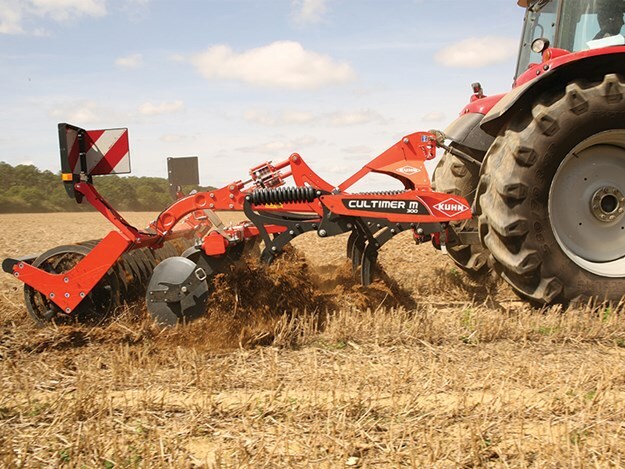 A multi-purpose machine for shallow, medium, and deep stubble cultivation, the Cultimer M 300 derives its versatility from the diversity of its wear parts: 480mm fins and 80mm and 50mm shares. The curved tines ensure high-quality cultivation and mixing. Improved soil engagement: The NSM tine, with double springs and 600kg, share pressure prevents slipping even in difficult conditions. A traction bolt safety tine version is also available for stone-free soil, with a 3000kg share pressure. Improved comfort and simplicity:The machine is quick and easy to adjust. The working depth and roller can be adjusted mechanically using spacers or hydraulically from the cab. The levelling discs can also be centrally adjusted. Wider choice:In order to adapt to light soils and dry conditions, the Cultimer M 300 can be equipped with levelling blades instead of levelling discs. A wide range of rollers are also available.